Welcome to Camp Runamuck Relax on the deck with your friends and family or swim at your private beach with your private swim platform, or just grab a fishing rod and beer and go fishing. 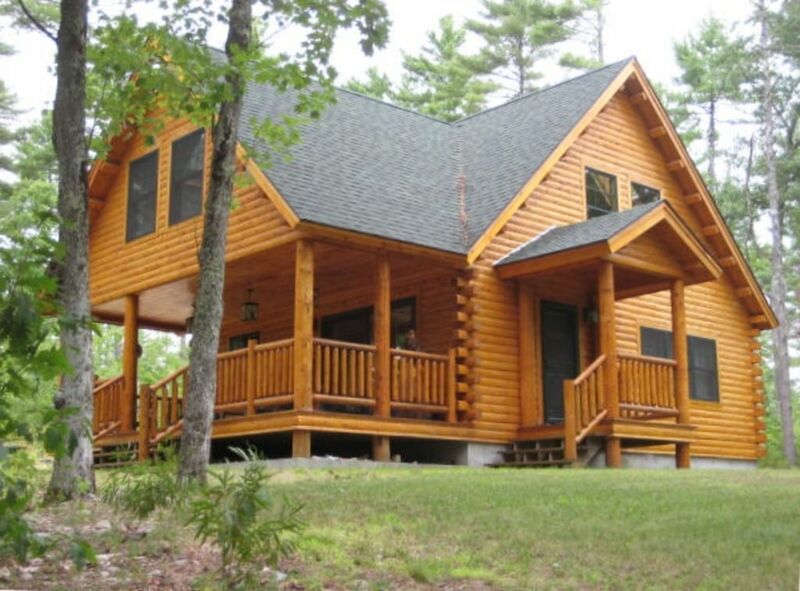 Three plus bedroom log cabin chalet on rear lot on Mousam Lake. The cabin is decorated in a lodge theme. Very beautiful inside . Short 1-2 minute walk across camp road down to Private Sandy Beach with excellent swimming ,also has a private swim platform in water, two boat dock for boats . Bring your own boat and enjoy 5 to 8 miles of both Upper and Lower Mousam lake. There is gradual sloping, clear & sandy bottom, private swimming as well as canoeing, fishing (small & large mouth bass, stocked salmon, and trout/togue), walking, golf and biking. Located 2 hours from Boston and only 40 minutes from the coastal beaches of Ogunquit and Kennebunkport or the White Mountains of NH, there is much to enjoy. Full package Store with boat gas on lake with boat access with parking. Fire pit outside cabin, firewood can be purchased down the st. Beautiful outside porch with seating accommodations. rentals. (arrival 2:00 pm Saturday .and departure 10:00 am Saturday, maximum occupancy 6-8 adults and children, $500 security deposit) Beds provided: 3- bedrooms, lower level with bunk bed with full and twin. Upper level bedroom with bunk bed with full and twin. Larger upper level bedroom with queen bed and futon. Half bath on upper level.All bedrooms have there own television and cabin has wireless internet. 1 pull out full sofa on first floor living room.sleeps two. LINENS AND TOWELS ARE NOT PROVIDED. . all though they can be supplied for vacationers traveling abroad 45 MINUTES TO OLD ORCHARD BEACH AND WELLS, 60 MINUTES TO THE SHOPS AND OUTLETS IN NORTH CONWAY. Cabin MUST BE left clean and ready for next rental. All trash bagged and put in trash bin on property. 2 dollars per large bag and 1 dollar per small (CLEANING SUPPLYS PROVIDED ) enjoy your stay in beautiful maine. Keywords: Lake Access, Water views, Swimming Beach, Cabin, Chalet, Maine, Woods, Watersking, Lake, Tubing, Relaxing swim platform, dock for boat ,canoe,rowboat, fire pit, store on lake. gas on lake, beautiful views. Self Motivated, . Honest, Fishing, Water Skiing. Quiet, Private, Clean, Wooded, Close to Boston.and white mountains and wells and old orchard, ogunquit etc. FEW WITHIN 10 MILES,sanford etc. Beautiful lake view with private sandy beach with private boat dock and swim platform. The cabin has wireless free internet. Beautiful log cabin decored kitchen with deer antler knobs and handles. (4) telvisions are in all bedrooms and entertainment rooms. Upstais balcony looing over the lower level. Outside deck with roof over head with plenty of seating and table. Private 100 ft.sandy beach with two docks and swim platform. short one minute walk from cabin, canoe, row boat,dock space for your boat, boat launch on lake, fire pit outside log cabin, picnic table, generator, A.C.
Beautiful. Didn’t want to leave. Can’t wait to go back! We had a great vacation at the lake and made a ton of wonderful memories. Thanks Paul hope to see you back again. Lovely little cabin on the lake. It was perfect for the whole family including the grandparents and dog! The owners were very friendly and responsive to email. We even had our own little sandy beach with dock. I highly recommend! What a clean and fully equipped cabin. We had an awesome time (2 grandparents, 2 parents and 3 children) and made some wonderful memories. Thank you Lenny and Donna! Additional charge of 150.00 per person per week will be charged for guests more than eight and will need approval of home owner.